The criminal complaint against Ahmed Abu Khatallah this week exposed the calculated lie perpetrated by the Obama administration in the run-up of the 2012 election. Justice officials charged Khatallah with planning the terror attack against the US consulate and annex. That the attack was a result of a hateful YouTube video. 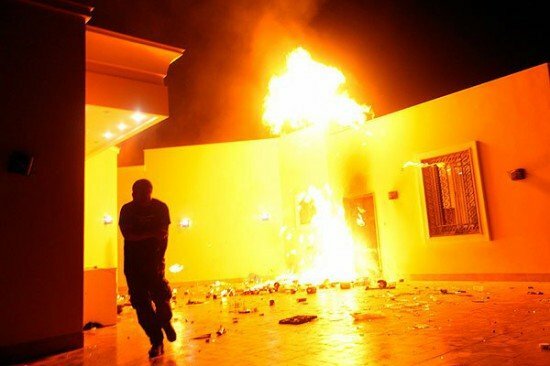 The Obama administration’s just-released criminal complaint against the alleged mastermind of the Benghazi terrorist attacks provides a final contradiction to its own evolving explanations for what happened that day. The Justice Department’s indictment spells out a calculated conspiracy by Ahmed Abu Khatallah and associates to attack the U.S. diplomatic mission and CIA annex, which killed four Americans. The indictment might be viewed as a death knell for a theory that the attack resulted from a spontaneous protest against a U.S.-produced video. Now in custody, Khatallah was a commander of Ansar al-Sharia in Benghazi, a U.S.-designated terrorist group, and is himself deemed a global terrorist by the State Department. During President Obama’s re-election campaign, the White House and senior officials blamed the September 11, 2012, onslaught as the work of demonstrators angered by an anti-Muslim YouTube video. Then officials spoke of a smattering of extremists who may have joined in to capitalize on the chaos outside the embassy, where Ambassador J. Christopher Stevens and an aide died as attackers torched the compound. But with the capture of Khatallah in June, the Justice Department is characterizing Benghazi not as the impromptu work of a mob but as a conspiracy hatched by terrorists who had infiltrated the port city in eastern Libya.